Running can often be a solitary activity. I know that I spend a lot of miles on the road and on the trail alone, and I love it. Still, there are times where I wish I could share my excitement with people in real life without feeling like a nuisance. Can anyone else relate? So here are just 5 ways to show some extra love to the runners in your life! Runners love to talk about running, don’t they? Personally, I like to talk about training plans, places to run, workouts, races…I guess since I have a blog, that makes sense! But if you’re a non-runner, just showing a little bit of interest is greatly appreciated. So often, people who run, especially marathon runners, are negatively judged. I’ve been called crazy for running in the dark, running in the snow, traveling to Seattle for a race, the list goes on. You don’t have to pretend that running is something that you want to do, but listening to your runner talk about their experiences and seeing things from their perspective shows that you care. How do you balance running with everything else? As a runner, having the physical support of your loved ones is SO meaningful, especially if you’re newer to running. One of the best ways of showing support is to cheer your runner on at a race. Many races will have designated cheer zones that are the perfect place to set up camp and support your runner. 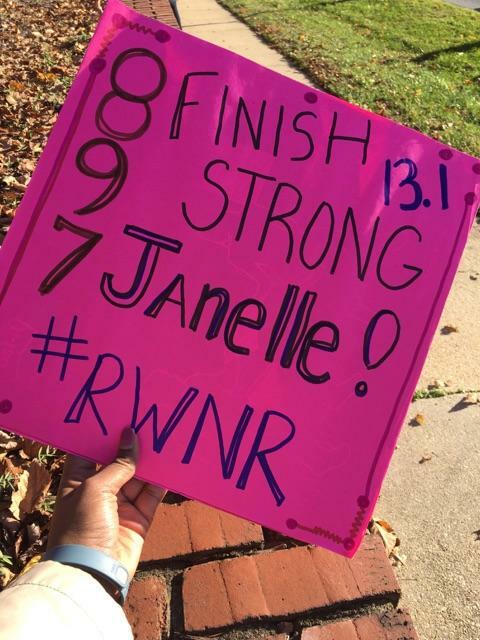 Who doesn’t love reading funny and encouraging race signs? Even if someone isn’t out there for me, I can feel that positive energy, especially if they’re out there in awful weather. Some people are a bit more private about their running and don’t want to be “fussed over”. Personally, I’m at the point where I don’t feel the need to have a cheering section. But trust me, I didn’t realize how much it would mean to me to have my family cheer me on in Buffalo where I PR’d the half marathon, or in Philly when my mom finally got to see me run. I will always cherish that moment, especially since she passed away. And if you can’t make it to the actual race, send them an encouraging text! Have celebratory drinks after the race! Give them a shoutout on social media. These are all wonderful ways to show your support. If you’re living with a runner who is feeling overwhelmed, if possible, take on a few tasks for them when they’re in their peak stress mode while training. I’m not saying that marathon training gives you a pass to be a complete slob, but if you need help, ask for it! Time management is a struggle sometimes and it’s important to work together as a team to get things done and to keep the stress at bay. Here are some ideas of ways to help the stressed-out runner that would be greatly appreciated! Believe it or not, runners do not always have the internal drive and motivation to get out the door. I post about this on Instagram all the time. Having a close friend or family member that can encourage you to run or work out when you really don’t want to makes a HUGE difference. I have often told my sister my workout plans so that she can “remind” me to take care of business. Bret has invited me to join him for a run many times, with me fighting him along the way, only to end up having a fantastic run. Runners do appreciate that additional push, especially on tough training days! The last way you can show a runner love is by extending grace. I’ve had very busy racing seasons over the past few years where I was training for marathons, running several half marathons, and traveling across the country for events. Running and training consumes a LOT of time. I’ve missed out on a lot of events as a result, and I have certainly felt guilty about it. Please know that we’re not intentionally trying to be MIA, we’re just doing what we love. We know that sometimes we have to sacrifice for our training, and giving us a hard time about it just makes us feel worse. Try to understand that taking care of ourselves does not make us selfish. We may be a little crazy, but we care about our relationships and want to continue to see them flourish. What ways do you prefer to show love to a runner? If you’re a runner, which action would you appreciate the most?